That’s an interesting thought that I hadn’t considered. You are right though, they were quite tidy in the way they were left. I was a bit suprised to walk by again two hours later and still see them there. Honestly, I like both. They evoke very different feelings for me. The first makes me feel as if I have happened upon the scene on a country lane are a late Spring day and I am so happy to be there. The second is more edgy, reminiscent of the starker side of the world. I often have dreamed of having a large house with multiple rooms, one for each emotion that I feel (it would have to be really, really big). I would want both of these pictures hanging there, but in different rooms. Wow, what a concept, a different room for each emotion. That’s just a really interesting idea. I agree though, this photo is quite different in these two varations. I much prefer your edited version Amy – to me it evokes a much stronger emotion. Nicely done. Ha – I am also stalked by a photo from time to time! This is an interesting one. I like them both – the wall in the original photo because of the colors and depth, and the less color-saturated ground in the second. And you left just enough hue in the grass…. Its interesting what you have done with the photo, but it was a pretty interesting shot anyway! Yes, I was thinking about that when I walked by again two hours later and they were still there! I like the edited version. The emotion of the unedited has been taken out and leaves it with a very special feel to it. Something of abandonment…. timelessness…. who lives there? Why is the milk up against the wall? 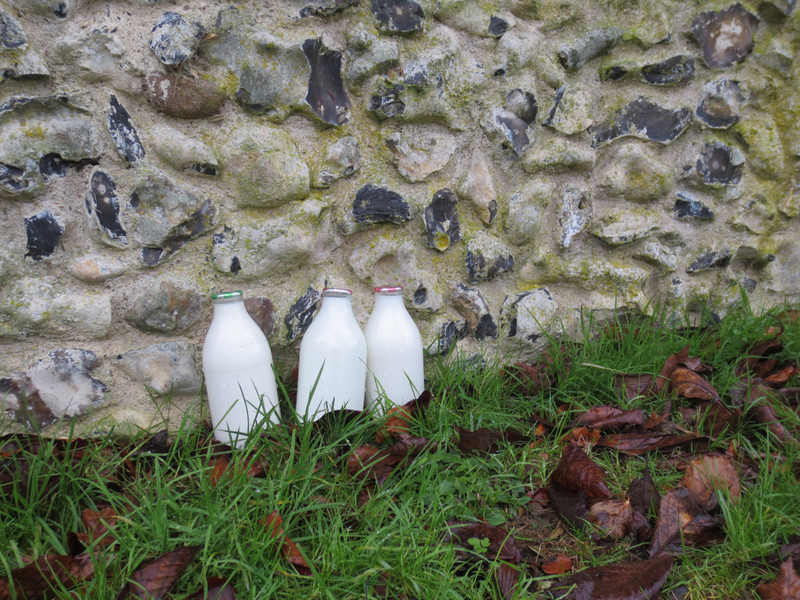 Where in the world do they still deliver milk in glass bottles and leave it places? These are the thoughts the edited version brings to my mind. Sorry this is such a long comment. Long comments are always welcomed. I would agree, I think this image could work as a writing prompt, there is a fair amount there. milk bottles have a old timey feeling for me (i buy cartons usually) so the b&w plays off the old-timey feeling which I like. You might think of cropping a bit more off though. The black oval (stone) at the top pulls the eye out so I’d take that out. I’d also cut a bit off the sides and bottom so that the grass starts at the 1/5 line and moves up to the 1/3 line creating a more obvious diagonal which will echo the diagonals at the top of the milk bottles. the leaves at the bottom right are very interesting in shape with their curls so I’d cut through the middle — too interesting so again pulls away from the milk bottles and cutting through their middle will disrupt that interest I think– but the leaves are very cool so I’d love to see a closer pic of the leaves themselves. These are just thoughts. I pay more attention to the shape of things in b&w than I do in color photos because for me shapes pop out more then. Probably other people don’t. I loved the pic, the lovely contrasts you have of the shape of the bottles against the stone, the smooth glass against the cobbled bumps and the bit of grass so it feels like an outdoor wall rather than a stoop on the house so it is also a bit of contrast of nature vs manmade. 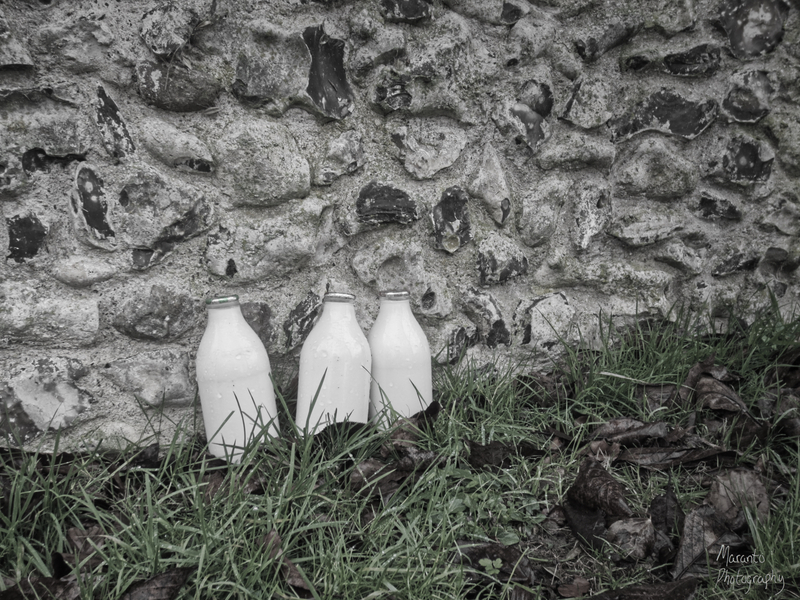 When I see the pic, I can feel the smooth cool glass of a milk bottle, the fading of summer into autumn, early morning back in time when they used to deliver milk daily (here in a USA city we have to drive to the store to get ours) so it also evokes a feeling of nostalgia. the b&w does all that while the color doesn’t (the color one might if the colors were shifted towards the pastel desaturated colors of handcolored photos but not the technicolor of film straight out of the box). You decision to go black and white/ desaturated grass is perfect. Sorry for the long comment, I just thought a lot of different things when I saw it. Thank you very much for this thoughtful comment. I agree that the leaves in this shot were interesting and therefore a bit of a distraction from the bottles. I’d have to give you cropping suggestion a go and then see what I thought. It is interesting to me what you are saying about the various elements and how a different crop might make this compositionally stronger. For me, this was a good photo for a desaturated variation rather than just black and white or just color. It’s a very good photo. I think you did an excellent job and made good choices. In university, I had a minor in Art Photography and every once in a while what I learned rears it’s head. Most of the time I don’t look at pics that way any more but yours caught my attention. It’s something I can envision printed large and hanging in a room. The 2 show two different moods. But personally I like the edited version because it has more drama. Thanks, it’s my favorite of these two for sure. As you know I am a fan of saturation but as you explained the process I can see how in the edited version the bottles pop out rather than the green. I’ll remember that tip and thank you for helping me to see it in a new way. Thanks for reading and giving what I am saying here some thought. Hi, Amy. I really prefer your edited version too. I agree that it was too colorful in the original and that distracted the viewer from the focus on the bottles. I think the edited version helps the viewer focus on the texture of the wall and the bottles. Nicely done! Thanks very much for this feedback. I’m glad you like my editing choices.